Guy named Pelias was the King of Iolcus. He has seriously pissed off Hera. He will therefore pay. Jason has plans to take back the throne of Iolcus from his "evil uncle" (yes, Pelias is his uncle, but he doesn't really know it). Pelias sends him off on the "impossible task" of finding the Golden Fleece*, hoping that Jason will die along the way, and promising the throne when he gets back. Jason, despite being a relatively inept hero himself, manages to get together a crew of Superfriends to help him on the journey. This group is called the Argonauts. Atalanta would have been one of them, except Jason was a little wary of having a woman on board and ended up refusing, tho reluctantly. 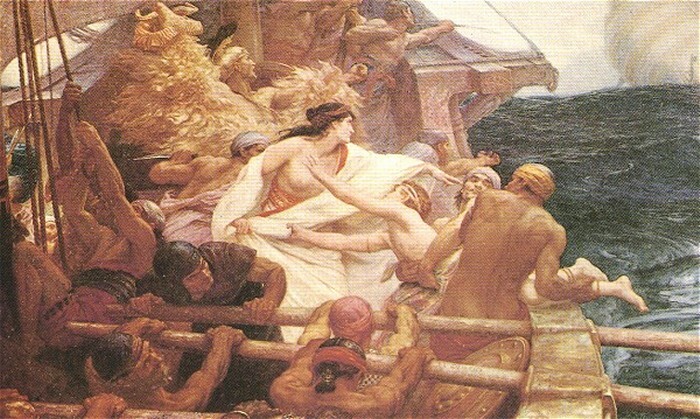 The Argonauts impregnate the entire island of Lemnos, where there are only women. This is unrelated to the rest of their journey. With Medea's help, they all get away. This involves her killing family members, and then subsequantly more trials for the Argonauts. Back in Iolcus, Pelias has killed Jason's entire family, except for his mother who cursed Pelias and committed suicide. They arrive with the Fleece. Pelias renege's on the deal. Medea, continuing her killing spree, tricks Pelias' daughters into killing Pelias and then boiling him alive. Jason, being a dumb sob, divorces Medea. I don't know what he was thinking, but you just don't divorce a witch. That is what they call a "bad idea." Medea kills Jason's new bride. Then she kills the children she had with Jason. Then she takes their bodies with her so he can't even bury him. Although this destroys her, she feels it is the ultimate way to get back at Jason, and revenge is more important to her at this point than anything else. Jason dies alone when the prow of the Argo (the hero ship he went on the adventure in) falls on him. Medea remarries and apparently moves on. Yes, I know this version kinda blows - but you can read the Argonautica or the Medea (by Euripides) on your own!